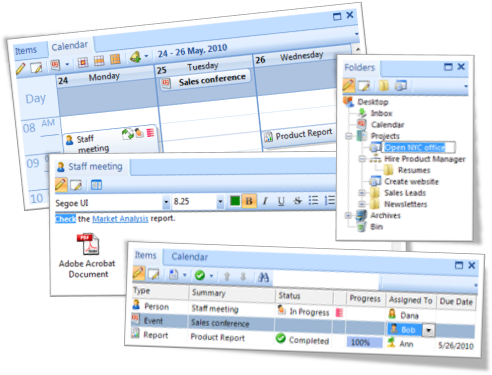 TaskMerlin is an intuitive and easy-to-use project management software and calendar software tool. Task Merlin makes it simple to organize projects, schedules, tasks and to-do lists. Designed to boost individual productivity and foster team collaboration over an office network. Supports David Allen's GTD (Getting Things Done) time management software system. Unlike other task management software, TaskMerlin offers complete flexibility for naming, structuring, and viewing your tasks. Easily store, organize, manage, and retrieve information. This information can be as simple as notes and appointments, or as complex as multi-person, multi-year projects. Supports 7 Habits and David Allen's GTD task and project management software system. Solutions include project management software, task management software, calendar software, personal information organizer (PIM software), to-do list software, GTD software, task outliner tool, time management software, bug tracker, notes editor, and calendar. Features include rich text, in place editing, multiple task editing, full customization, keyboard shortcuts, e-mail, reminders, images, powerful search, visual SQL filtering, recurring tasks, Microsoft Outlook support, USB flash drive or memory stick, multi-user simultaneous database access over LAN and Internet, user security permissions and powerful administrative tools.